We had to say goodbye to one of our sweet souls, Pippy. 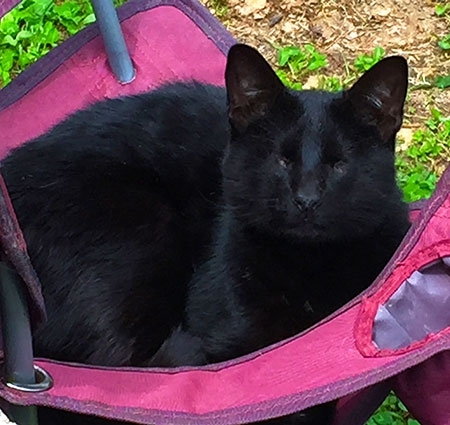 She was one of our blind girls that arrived at a shelter in Austin as a kitten, scared and with underdeveloped eyes. Here at the sanctuary, she was loved by everyone, including her cat friends, Buddy and Osito, who enjoyed napping together and grooming her. She had just found a new favorite napping spot on the deck in the hammock under a bench. Tonight the hammock is empty. The cats surely sense she's passed. Pippy was one of the sweetest kitties at the sanctuary and we miss her terribly. We buried her under the oak tree next to the cat enclosure. Fly free, sweet baby. We'll never forget you.